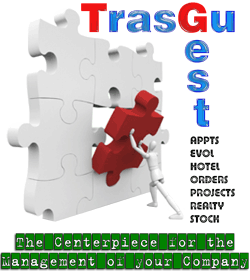 TrasguGest Appts is the perfect solution for managing your business appointments. Additionally, it will allow you to keep track of all your appointments, controlling its start and end times in real time. You can locate any appointments through its unique tracking identifier or also search appointments by date or by Client. If desired, and as an optional module, it will also allow you to make available to your Clients a tool to check online your availability or even to request appointments from your website. This module provides integration with PayPal, allowing you to charge your Clients directly from your website. PayPal is an internationally recognized secure payment platform, which accepts bank transfer, credit or debit card or PayPal balance. TrasguGest Appts is constantly reviewed and updated. We are grateful in advance for any question, comment or suggestion you may wish to make.